Kepler (1571-1630) was appointed Imperial Mathematician in 1601, and through his work on Mars (in New Astronomy, 1609) he discovered that planetary orbits were elliptical. He is also noted for his attempts to find the causes of the planetary motions contained in his model. Detail of the frontispiece from the Rudolphine Tables. 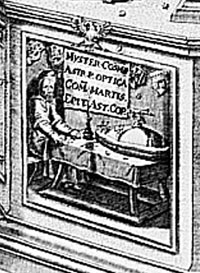 A portrait of Kepler with the titles of his major works, Mystery of the Universe, The Optical Part of Astronomy, New Astronomy (Commentary on Mars), and Epitome of Copernican Astronomy. Regular polyhedra from Kepler's Mystery of the Universe. Kepler was born a son of a poor mercenary solider in 1571. He received his education through the scholarship system in Württemberg which was set up in order to produce teachers and Lutheran pastors for the Duchy. In 1589 Kepler entered the Stift, the theological seminary at the University of Tübingen, where he was awarded MA in 1591. At Tübingen, he learnt Copernican astronomy from Michael Maestlin (1550-1631) to whom he later described himself as a 'Lutheran astrologer'. Kepler interrupted his theological studies in 1594 to take up an appointment as mathematics teacher at the Lutheran school in Graz. He was dismissed from this position in September 1600, as all Lutherans were ordered out of the district. Earlier that year, Kepler had worked with Tycho Brahe for a few months, and after failing to obtain a position at Tübingen, Kepler traveled to Prague to join Brahe. Brahe died in 1601, and Kepler succeeded him as imperial mathematician to Rudolf II. He frequently helped with the astrological interests and needs of the Emperor and visiting dignitaries. After Rudolf's death, Kepler moved to Linz in 1612, retaining his position as court mathematician with Rudolf's successor, Matthias. Kepler moved to Ulm in 1626 when the Counter-Reformation and unrest broke out in Linz. From Ulm, Kepler moved to Sagan in 1628 at the invitation of Count Albrecht von Wallenstein. Kepler's life was beset with financial instabilities, religious persecution, personal tragedies (including his mother's witchcraft trials) and turmoil of the Thirty Years War. He was on his way to settle financial affairs in Linz, when he died at Regensburg in 1630. He was owed 11817 gulden by the Emperor at the time of his death. The dedicatees of Kepler's numerous publications on astrology, astronomy, chronology and snowflakes indicate the range of patrons whom Kepler hoped to, and had to, rely upon for his livelihood. 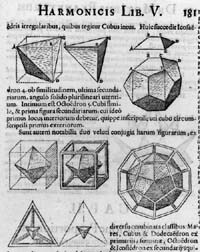 The significance of Kepler in the history of astronomy lies in his efforts to establish a celestial physics: he searched for physical causes of astronomical events describable by geometric proportions and harmonic relationships. Traditionally, causal investigations of the heavens were the domain of natural philosophy and astronomy was a mathematical discipline which provided models or 'hypotheses' which had no claims to the physical reality of the universe. Kepler, however, believed that there was an 'hypothesis' that was physically true Ü the Copernican one Ü and that humans were endowed by God with geometric and harmonic intuitions to find it. 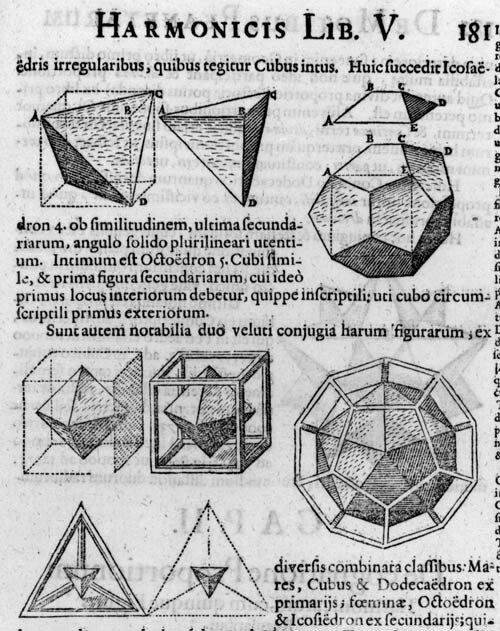 In the Mystery of the Universe (1596), Kepler proudly related one of his earliest discoveries Ü he could derive a priori the number and arrangement of the planets from the fact that there were five and only five regular polyhedra. He was so enthralled with this discovery that he planned to commission a goblet of this model and dedicate it to the Duke of Württemberg. Kepler sought a physical explanation of why these planets orbited around the sun in the 'moving power' of the sun, the 'anima motrix'. 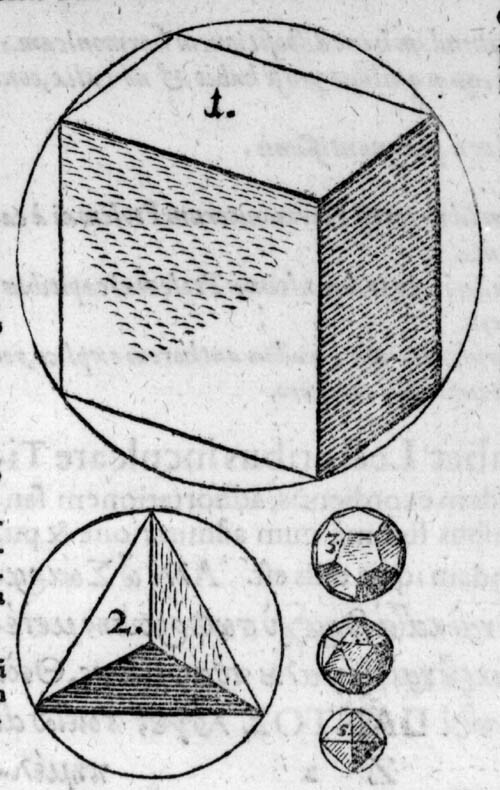 Kepler further speculated that this was the magnetic force of the sun, pulling planets along its own axial rotation in the New Astronomy or Causal Celestial Physics (1609), which included his commentary on Mars. From the idea that the speed of a planet was inversely proportional to its distance from the sun, he arrived at what later came to be known as his second law, that the radius vector from the sun to the planet sweeps equal areas in equal time. Moreover, those planets moved in elliptical orbits with the sun at one focus. This was significant for Kepler not simply because it fitted observational data, but also because the sun was in one of its foci. It was a ïtrueÍ geometric system that went hand in hand with the physical system. In the Harmony of the World (1619), Kepler argued that the human soul was endowed by God with the ability to intuit the harmony in the universe. His favourite analogy was that the sphere of the universe was created in the image of the Trinity. This book is the most eloquent example of Kepler's belief that astronomers were the priests of almighty God with respect to the Book of Nature and that their business was to praise God's glory. From his magnetic principles, he derived the law that the periodic times of any two planets was precisely one and a half times the proportion of their mean distances. Kepler published a textbook of Copernican astronomy written in a question and answer form, the Epitome Astronomiae Copernicanae (1617-21). This explained the theory underlying his Rudolphine Tables, whose completion by Kepler was Brahe's dying wish. After protracted and cumbersome negotiation with Brahe's heirs, the imperial treasury and printers, they were finally printed in 1627 and provided tables that were far more accurate than its predecessors. Kepler is often called a mystic or a Neo-Platonist for his metaphysical views, but it is important to appreciate the richness and breadth of his thought which gave rise to, among others, the three laws (though he never stated them systematically in the form that we know them today).